With ever-growing competition among professionals, it is important that college students get right kind of training so that when they start working, the pressure of performance only brings out the best in them. It is the duty of college faculty and mentors to give students the sort of guidance which makes them ready to take on the challenges of professional world. This training, coupled with good placement, is what every student aims for while joining any college. Not having to run around looking for job is a hard-earned luxury which colleges attempt to give to their students. Mathura based GLA University is no different and has companies like Accenture, Amazon, LAVA, HCL, JK Tyres, Royal Bank of Scotland, HDFC Bank, TATA, Samsung etc visiting the campus every year to hire students across courses and fields. Numbers do not lie and the placement statistics over the years prove that GLA is the place for students to be at. 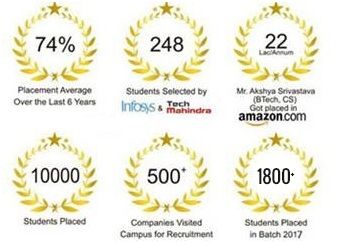 Over 500 companies have visited the campus and recruited over 10,000 students till now. The placement average over last 6 years stands at a whopping 74 per cent. In 2017 alone, around 1800+ students got placed in various companies till May 15, 2017. The students of GLA are also making India proud internationally with hundreds of them working for companies like Capgemini, HSBC an IBM in USA, Australia, UK and Singapore. GLA has an active Training and Placement cell which constantly works towards ensuring employment for students by organizing workshops where they are taught how to be an effective team player and other basic requirements of being a professional. Led by experienced professors, the GLA T&P Cell introduces students to the concepts of corporate culture and acts as the bridge between them and the industry so that demands and expectations of both are fulfilled. It helps polish the skills of students while helping the employers to find the perfect candidate with technical and managerial skills. The cell also provides assistance to students in applying for summer trainings in good companies as the university critically evaluates these projects which also form a part of the curricula. Guest lectures are important for the process of making student to professional transition smooth and at GLA, industry veterans and experts are often invited to share their knowledge and first hand experiences with our students. Mr. Rajit Sikka, Academic Relation Manager-North INDIA From Tata Consultancy Services Ltd, Dr. Kowk wu, Head of Embedded Software and Systems from Freescale Semiconductor, USA and Mr. Manas Tygai, Campus Connect team from Infosys Ltd are only few of the industry experts to share their valuable advices with students. At GLA, every step is taken towards updating the curriculum according to the needs of the industry by taking inputs from the experts in the field. Industry Relevant Input Championship Programme has been formulated for the benefit of faculty-members and students and aims to inculcate both technical and managerial aspect-related inputs which are deemed necessary and relevant to industry. The recruiters from various organizations vouch for the quality of talent and professionalism in the students of GLA and praise the institution for its dedicated grooming process. This is reason enough to prove that the institution does not compromise when it comes to value education and all-round development of its students.